Everyday new wordpress plugins and wordpress widgets are released or updated so it is very useful to check out the official WordPress website and of course some wordpress plugin forums.You can definetely find interesting,useful and updated plugins.The below wordpress plugins are not known much but i’m sure at least,few of them will be useful for your wordpress blog. This is a simple, lightweight plugin that adds tooltips to your ‘links’ widget using jQuery. The tooltips appear with a bubble image and the description of the link. please leave your comments if you have any suggestions for enhancement. Automatically encodes every e-mail address on posts, pages and sidebar widgets to prevent spam. Simply decodes any previously encoded e-mail address by just clicking the mail link.This plugin does not have any graphical user interface – just activate it in your WordPress backend and let it do its job. You can integrate it in any website for free without even using Flash. It’s a fully skinnable and customizable page flipper with different shadow gradients, alpha and colors. It has a completely skinnable control bar through the skin.xml file. Supports SWFs and multiple types of images (JPG, PNG, BMP, GIF). You can have additional animated text with lots of animation and positioning properties and the text is CSS customizable. Slideshow can be enabled (auto flipping) with different page flipping types and durations. Flipping sounds can be optionally added through external mp3. You can enter in zoom mode or you can go to an URL when clicking on a page. Authors Widget shows the list or cloud of the authors, with the number of posts, link to RSS feed next to their name, avatar. It is useful in a multi-author blog, where you want to have the list in the sidemenu. The widget can also display an “Author Cloud” if SEO Tag Cloud plugin is installed. Each tab works as a container for any other widget WordPress. Thus, for example, you can create a tab for the last comments, one for recent posts, one for categories, and so on, for a given instance of the plugin (widget). This plug-in will create a vertical scroll news or Announcement or flash News for your word press site, we can embed this in site sidebar. Turn your WordPress website into a Social Network comparable to Facebook or LinkedIn. Mingle makes it easy to create a social network for your family, church, business or even a premium membership site! Mingle uses your standard WordPress website and standard WordPress theme to create your Social Network instantly. Subscribe-Widget is a free wordpress plugin, which was designed to be used by all bloggers wishing to inform readers about specific information, in a fast and reliable way. This plug-in will create: rss2, comments rss, twitter and feedburner icons on your blog sidebar. These icons will in turn lead readers to your rss, twitter, feedburner and comments rss, accordingly, readers will then be able to find the latest news on your blog. If you want you can disable these icons one by one and only leave those which are needed. Blog Protector is a wordpress plugin which can Protect your valuable blog content as from getting copied.Many Bloggers simply copy-paste the content from your blog without giving credit to the original source.This plugin basically disable the text selection & right click which will make the bloggers difficult to copy the content. * Disable right click on your blog. This plugin adds the Google Reader Stats to your blog. 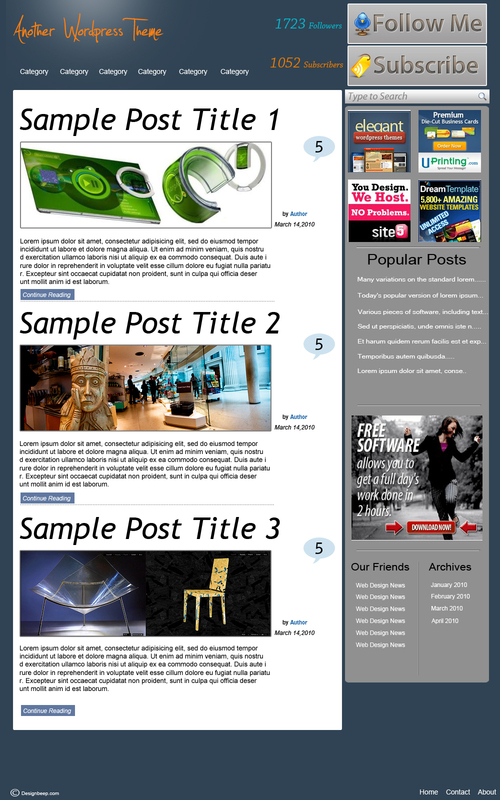 GRS measures the likes count of each blog feed item on Google Reader and displays it on your blog . The GRS Widget enables readers to easily see the blog’s best content, with the highest overall likes on Google Reader. This plugin makes the options for wp_tag_cloud() available to a tag cloud widget and a shortcode. This means that you can easily choose things like font sizes, HTML markup and ordering. See the wp_tag_cloud page for what the settings can do.Additionally, it is possible to sort tags by count and alphabetically at the same time. It is also possible to add a counter to the tags, so that your visitors can see how many posts are associated with each tag. The plugin also adds a sensible CSS class to every tag. CubePoints is a point management system designed for WordPress blogs. Users can earn points by posting comments creating posts, or even by logging in on your site. Encourage your users to comment on your posts by offering them points which could be used to purchase items / upgrades / etc. Users will be awarded a certain number of points for each comment they make. They can be awarded with ranks automatically when they reach certain points as well. The text widget that comes with the wordpress does not allow you to include PHP code. This plugin adds a new widget called Samsarin PHP Widget, which will allow you to include PHP code, as well as plain text and HTML. * Add up to 25 Samsarin PHP Widgets to your sidebar. * Add PHP code to both the widget title and the widget body. * Reset allows you to easily revert the contents of a widget. This plugin adds a Like-Button after every post/page you choose (you can exclude some IDs. These exlucded IDs will have no Like-Button). The Like-Button-Widget includes a little Like-Button-Generator to make it easier for you to get a Like-Button to your sidebar. It also adds a Shortcode for your like-Button. It is also possible to choose the XFBML or the iframe-Button. You could also choose the position of your like-button within the post/page. A high-performance caching plugin for WordPress, and a plus for WP-Cache or WP Super Cache.If your site get a very high traffic, or your blog are hosted on a shared server, or Google crawl your site frequently, you do need cache. If you use widgets, you do need WP Widget Cache. Embed video widget into your WordPress blog and you it will upload, record and embed video of your own or Youtube video into your blog posts in couple clicks. This video plugin lets you and your users embed video to your WordPress blog easily. When you’re editing your post you can click Bubblecast icon in Upload/Insert section, record or upload your video and have it embedded into the post immediately. Users can add video comments to your WordPress blog posts in the same way. Smartlinker is a toolbar on the WordPress TinyMCE editor that enables you to hyperlink words and phrases in your blog. Type word/phrase, select and right click to get a list of hyperlink.A word/phrase can be the name of a person, place or thing. The web pages are crawled from the world wide web. Probably the most advanced, flexible, customizable and easy to use audio/video player without using Flash.This high customizable video/audio player can be embedded in any website for free without any Flash knowledge. It can have an overall width and height up to 1680 x 1050 pixels and supports fullscreen mode. It has over 100 customizable properties which can be modified using just a settings.xml file. You can insert your own subtitles for videos, the text being easy customizable using a style.css file. The Cover Flow FX can be embedded in any website for free without even using Flash and it can have an overall width and height up to 1680 x 1050 pixels. The Cover Flow uses the Papervision3D engine and has multiple plane and camera views. It supports all types of images (JPG, GIF, BMP, PNG) which can have different sizes – they will be automatically adjusted to fit in the same height. It has an auto play function with external PNGs (customizable) for play/pause buttons. Optional scroll bar with multiple skins to choose from. Extensive configurations for tooltip and reflection. Plugin to help people share, bookmark, and email your posts and pages using any service, such as Facebook, Twitter, Google Buzz, Digg, Delicious, and well over 100 more social bookmarking and sharing sites. The button comes with AddToAny’s customizable Smart Menu, which places the services visitors use at the top of the menu, based on each visitor’s browsing and usage history. Send and receive e-mail messages on the administration panel and optionally receive SMS messages containing the sender, subject and (part of) the text when new messages arrive.All e-mail is text based (HTML will be converted to text). However, it is possible to view HTML messages and to download attachments. Mail can be received by POP3 or IMAP and sent by PHP mail or SMTP. There is a simple address book for both e-mail addresses and phone numbers, which can optionally be populated by your WordPress users. Designed for average users to use, ideal for developers who want to save time, this plugin gives links to the most prominent Social Networking sites for sharing and following, presented in many different formats (widgets/shortcode/template tag/auto added). It offers the following features. Nextgen Cu3er Gallery: A WordPress Plugin that allows you to use the amazing Cu3er Gallery viewer on your NextGen-Gallery(http://wordpress.org/extend/plugins/nextgen-gallery/) galleries. In order to use the cu3er galery viewer on your blog, you need to be using the best WordPress gallery manager: NextGen Gallery. You can integrate it in any website for free without even using Flash. It’s a completely customizable flipping countdown clock. The general width and height and each item’s width and height can be easily modified. It can show/hide the days, hours, minutes and seconds and arrange them in any order. It has shadow properties available like distance, color, angle, alpha, blur with customizable font faces, colors and sizes. Adds job listings and allows visitors to search, register and apply to jobs on your WordPress site. Job applications can be customized and triggers can be added to perform actions based on applicant responses. As a French Maths teacher, I discover this list today and will use a lot for my wordpress educational project. Very useful, thank you Arshad.